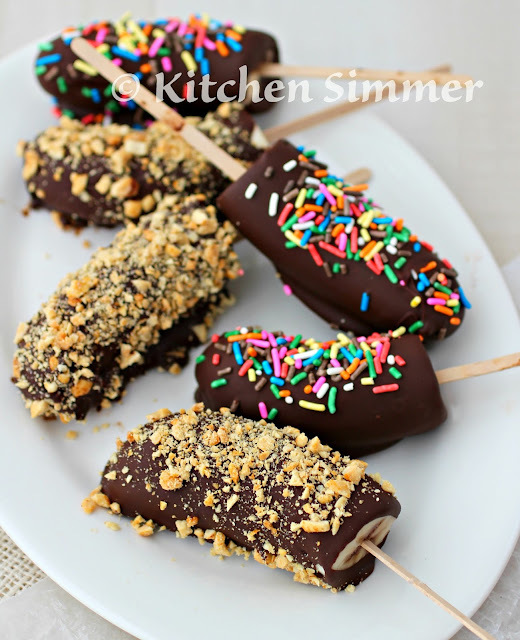 Chocolate covered bananas topped with nuts or sprinkles is a fun treat any kid or "kid at heart" will love. 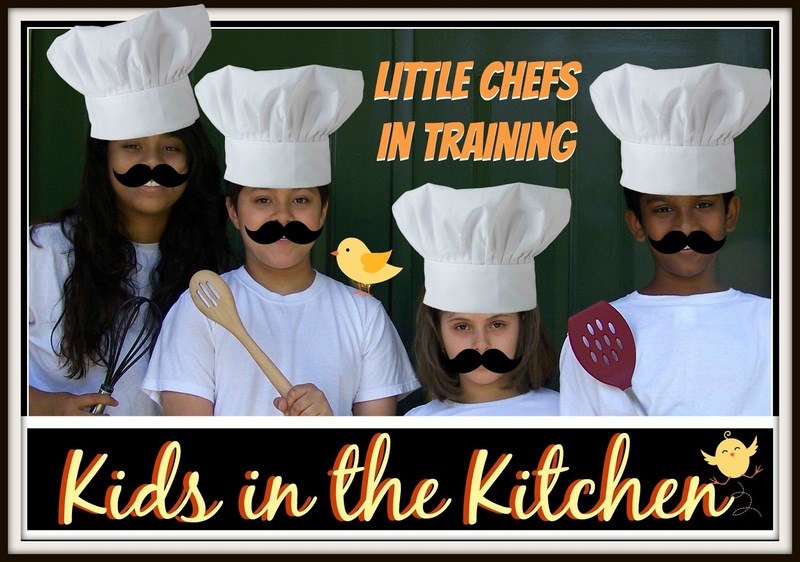 I love getting my kids in the kitchen with me. They love when they can make something for the blog in their "Kids in the Kitchen" series. Today we have our Chocolate Covered Bananas Pops and they are so fun and easy to make. You have to make them -even if you don't have kids in your house! We had some fabulous weather this Sunday with temperatures reaching almost 70! Unfortunately, spring is not ready to be sprung just yet, because we will get back to the 40's before the end of the week. The kids had to celebrate the warm weather with this chilled banana treat. 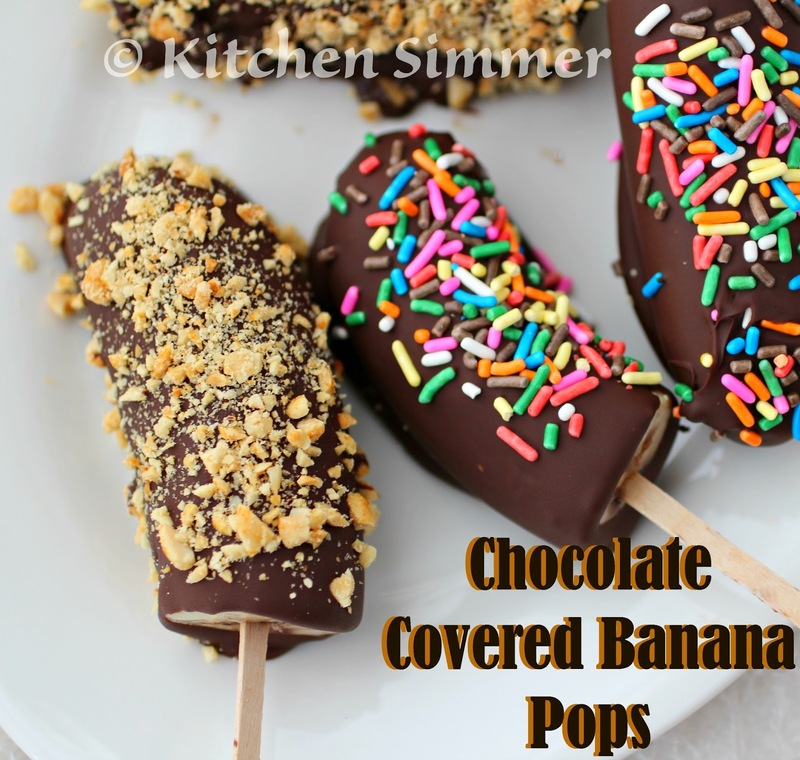 You can customize it by adding any toppings over the chocolate coating or you can simply coat the bananas in chocolate and call it a day. My son wanted peanuts because (like me) he loves peanuts and chocolate together. My daughter on the other hand loves every thing sweet, sweet, sweet and pretty. 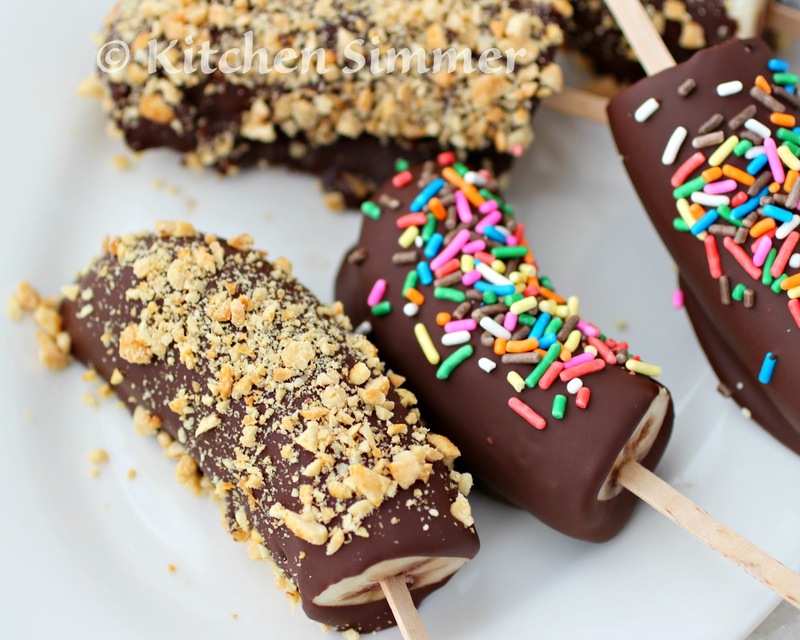 She wanted to put rainbow sprinkles on all her bananas pops. They sure look festive so I think they all turned out great. This is a great recipe to make with your kids and they will have a blast making their chocolate creations. The fact that a banana is the center of the recipe is something I love the most and they don't even think twice about. I call that a win-win. Step 1: Melt Chocolate on stove top (double boiler method) with the coconut oil. Step 2: Chop peanuts and gather sprinkles or any desired topping. Step 3: Peel and cut bananas in half. Insert ice cream stick to the cut side of each banana. Lay on a parchment or wax paper lined baking sheet. Step 4: When chocolate is melted, dunk each cut banana pop into the chocolate and cover completely. 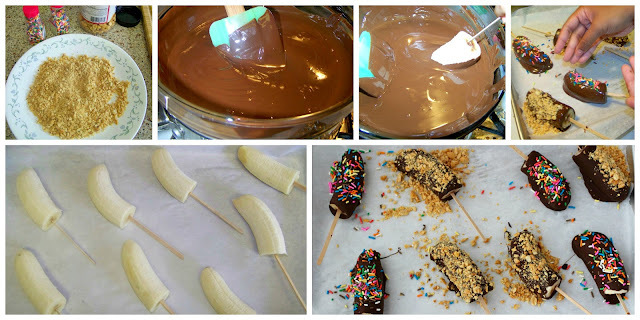 Hold bananas over chocolate and allow excess chocolate to drip back into melted chocolate. Step 5: Before laying covered banana down sprinkle each one with your desired toppings and make sure to spin it around to get all the sides. Then place back on parchment lined baking sheet and put into the freezer. Leave in freezer for 15-20 minutes until fully chilled and chocolate is set. Eat and enjoy. 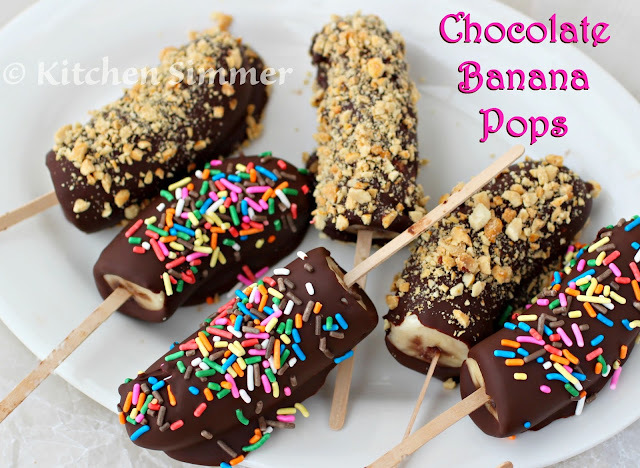 I was just thinking about making more chocolate banana pops because we have fresh bananas from our banana trees this year. I love the additional toppings that you added. So fun! This is such a great way to get the kiddos to eat more fruit and to use up all those ripe bananas. My girls love cooking projects like this that are so easy! I used to make these with the kids when they were young! They loved them! Ramona - your kiddos are adorable (that's them in the picture right?) 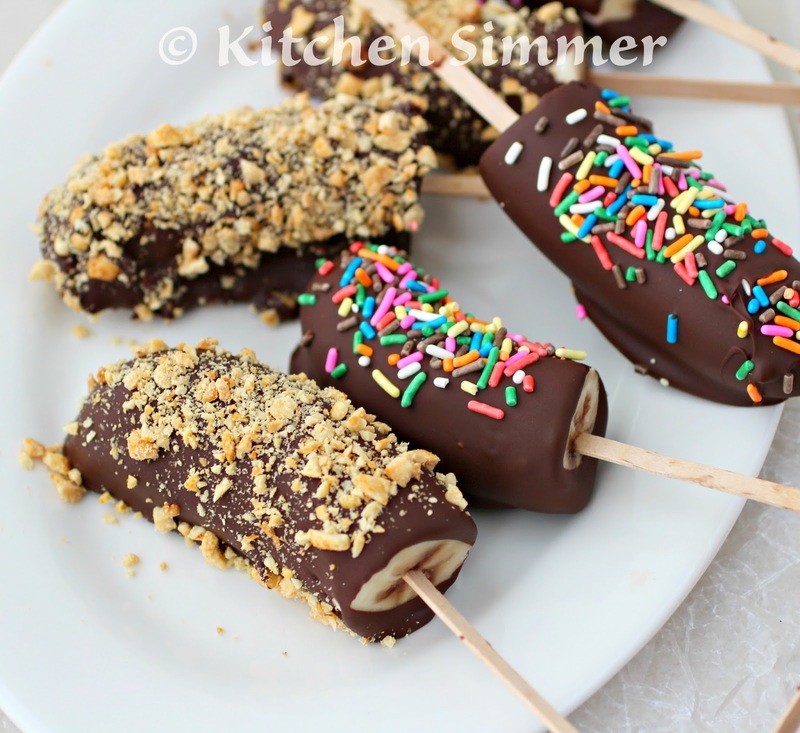 By the way - my daughter has loved banana pops since she was a young un - and so have Ibut it's been awhile since we made them so thanks so much for the reminder! What a great treat Ramona! I can tell the kids had a blast making these. So fun, love the toppings. We are looking for spring around here too, but not yet! Oh my, I'm sure your children had so much fun making these and better yet eating them! They're adorable...4 kids. Wow!! Great recipe. I think that this one gonna be very tasty! Also i gonna post some recipe http://www.finerminds.com/spirituality/spiritual-loneliness at this blog. Keep up posting nice info!